Card Text Play: Use an artifact controlled by any player as if it were yours. Destroy that artifact. If there are no artifacts in play, can I still play Poltergeist to gain the Æmber bonus? 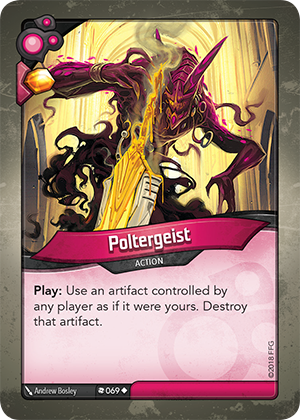 Can Poltergeist be used to destroy an artifact without an “Action:” or “Omni:” ability? Yes. The second part of the ability (“Destroy that artifact”) doesn’t include the preceding phrase “if you do”, so using the artifact is not mandatory for destroying it. You always resolve as much of a card ability as possible, so if the opponent’s artifact can’t be used because it only has a constant ability, you just destroy it.